Sweet satisfaction in a high protein bar created just for women. 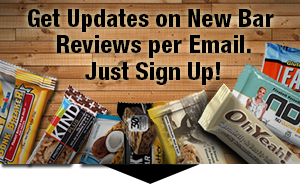 LUNA Protein Bar is the first gluten free option from LUNA and is a great source of both fiber and B vitamins, not to mention it has 12 grams of protein to tide you over between meals. INGREDIENTS: Soy Protein Isolate, Organic Cane Syrup, Peanuts, Organic Dried Cane Syrup, Palm Kernel Oil, Vegetable Glycerin, Organic Peanut Butter, Inulin (Chicory Extract), Cocoa, Natural Flavors, Whey Protein Concentrate, Salt, Soy Lecithin, Tapioca Starch, Almonds, Organic Vanilla Extract. Vitamins & Minerals: Calcium Carbonate, Ascorbic Acid (Vit.C), Tocopheryl Acetate (Vit.E), Ferric Orthophosphate (Iron), Beta Carotene (Vit.A), Niacinamide (Vit.B3), Folic Acid (Vit.B9), Vitamin B12, Vitamin D2, Thiamin Mononitrate (Vit.B1), Riboflavin (Vit.B2), Pyridoxine HCl (Vit.B6). Allergen Statement: Contains soy, dairy, peanuts, and almonds. May contain traces of other tree nuts. No hydrogenated oils. We source ingredients that are not genetically engineered. The chocolate coating was being described as very rich and creamy. Buyers’ opinions about the taste were very widespread but mainly very positive and the majority liked them a lot. Buyers describe it as a little gooey, dense and maybe a bit too chewy. The flavor of for example cherry and almond is definitely there but no or little of the actual fruit/nuts. No crunch. Buyers advice against ordering them during the summer months due to melted chocolate coating. 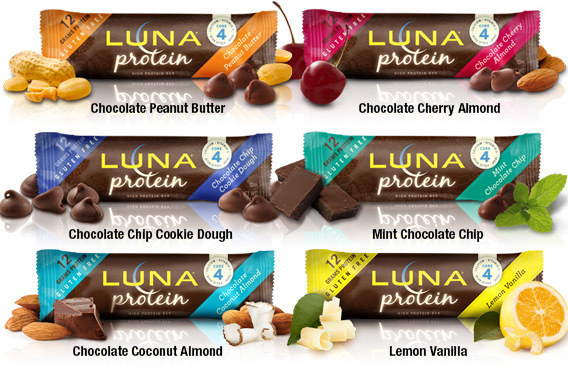 Luna Protein bars are a little smaller than the regular Luna bars, but still have about 180 calories. Luna sources ingredients that are not genetically engineered. They also don’t use any hydrogenated oils. Like all Clif Bar products, their line Luna Bars is very affordable with $1.69 per bar at retail. Better deals can be found online. 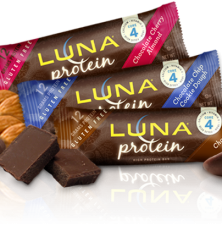 The Luna protein bars are awesome! My favorite is the Mint Chocolate but they have a decent selection of flavors to choose from and I haven’t tried one yet that I didn’t like. We are not fans of this bar for a few reasons: the taste is chalky and the ingredients are sub-par. Rather than cocoa butter, the chocolate uses Palm Kernel Oil which is lesser quality and controversial in terms of sustainability. Also soy protein isolate is a known allergen and has a lot of other potential bad effects. For the calories, sugar and protein there are so many better options. I definitely didn’t like this bar. It was hard as a brick!